Recover a fellow mage's staff to obtain a recommendation from Bravil. Speak with Kud-Ei. She will ask for help recovering a guild member's stolen Mage's Staff. Find the suspect and get him to admit to taking the staff and selling it. Deliver the news about the staff being sold to Kud-Ei. Travel to the Imperial City and find the buyer of the staff. Purchase back the staff or persuade the buyer's wife to help you. Return to Kud-Ei with the staff for her recommendation and a new spell, Captivate. Speak with Kud-Ei in the Bravil Mages Guild about a recommendation for you. She wants you to go talk with Varon Vamori concerning the theft of Ardaline's Mage's Staff. In order to get the quest, make sure you talk to Kud-Ei about: Ardaline, Varon Vamori and Mage's Staff. She'll give you a Beguile scroll (providing a Charm effect) in case Varon is not cooperative. Varon is either in the guild, at home (north of the guild hall), in the chapel or in Silverhome on the Water. Confront him about Ardaline; he'll readily admit anything as long as his disposition towards you is at least 65. Once his disposition is high enough, he'll admit that he took her staff and sold it to Soris Arenim in the Talos Plaza District of the Imperial City. Return to Kud-Ei, and inform her about Varon selling the staff. She will give you three more Beguile scrolls and order you to retrieve the staff - discreetly of course. Find Soris' house in the Talos Plaza and confront him about the staff. If his disposition is low he will refuse to give up the staff. Raise his disposition up to around 70 or so and he'll hand over the staff for a little cash (200 gold). Alternatively, you can talk to Soriss' wife, Erissare Arenim: with a sufficiently high disposition she'll reveal that the staff is in a chest (although it is actually kept in a set of drawers) in the basement, and the key is in his desk (upstairs), although the chest can simply be picked or opened by an Open Lock spell. You can also choose to pickpocket the key from either Soris or his wife in order to open the chest. Return with the staff to Kud-Ei to earn her recommendation as well as a spell, Captivate. Be aware that the more-effective, lower-Magicka Beguiling Touch spell is available from Delphine Jend, also in the Bravil Mages Guild. Captivate is useful, however, as a free way of acquiring the spell effect for custom spellmaking purposes. It is possible to steal the staff from Soris before talking to Varon. However, you must talk to Varon before the message, "I've stolen the staff from Soren Arenim's house. I need to deliver it to Kud-Ei in Bravil." will appear. Complete the quest "Through a Nightmare, Darkly", then return to Kud-Ei after the quest is done. The recommendation quest should now be available. You can use the console command setstage 0002D936 10 to set the recommendation quest back to the starting stage. This is best if you have not yet told Kud-Ei that you are ready to follow her to Henantier's house. Kud-Ei will then stop talking about "Through a Nightmare, Darkly", until you finish the recommendation quest, at which point you can proceed with that quest as normal. 10 I've been given a charm scroll, and need to use it to help persuade Varon Varmori in Bravil to return Ardaline's staff. 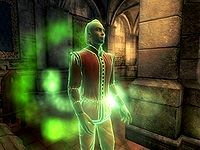 20 Varon Vamori admitted to taking Ardaline's staff, but has sold it to a friend in the Imperial City. I need to deliver this news to Kud-Ei. 30 Kud-Ei has given me several more scrolls, and asked me to get the staff back. I need to find Soris Arenim in the Imperial City. 40 I've spoken with Erissare Arenim. She told me that Soris has the staff in the basement of their house. 50 I've spoken with Soris Arenim. He will not give back the staff, but will sell it for 200 gold. If I choose to buy it back, I need to pay him the money. 60 I've paid Soris Arenim, and he has given me Ardaline's staff. I need to deliver the staff to Kud-Ei in Bravil. 90 I've stolen the staff from Soris Arenim's house. I need to deliver it to Kud-Ei in Bravil. 100 Finishes quest I have delivered Ardaline's staff to Kud-Ei, and have earned a recommendation for it. It is possible to use the console to advance through the quest by entering setstage MG03Illusion stage, where stage is the number of the stage you wish to complete. It is not possible to un-complete (i.e. go back) quest stages. See SetStage for more information. Esta página foi modificada pela última vez à(s) 06h10min de 19 de junho de 2015.